The tenor Uly E. Neuens has devoted many years to classic opera repertoire and old music. Over the past ten years he has sung on some of the most important opera stages in France. Neuens, who trained under Christian Jean in Paris, has also performed to great acclaim on many great international stages. The key stations in his CV include the Opéra Garnier and the Opéra Comique in Paris, the National Theatre in Madrid and the Grand Theatre in Shanghai. Alongside classical music, Uly E. Neuens has also been a passionate reggae fan for over 20 years. Over the years, the vision of merging classical vocals and reggae music crystallized. Neuens’ core idea was not addition, but integration: not a culture clash, but instead a collaboration which would trigger a mutually enriching joint process. Not only is this approach unusual, it has also never been attempted in this form before. In 2012, he found the ideal partner for this creative venture in Irie Ites Music, a small, but exquisite reggae label which since 2008 has been building bridges between many different varieties of reggae without ever losing sight of its main passion: dub. The track “Pax”, a musical cooperation with Hanover-based Felix Wolter aka TVS, was the first release in the ‘Op’Ra Dub Style’ (7” vinyl). Also featured on the track is MC Speng Bond from England. The vocals are composed under the name AudioArt, a project in which Uly E. Neuens cooperates with Philippe Thilliez (on “Pax”) and Moussa Sfeir (all other tracks), classically trained composers, in order to achieve the very best result in each project. AudioArt’s compositions build a bridge between classical and popular music, revitalising these old categories and, through the combination, breathing fresh life into them. The first cooperation with TVS was followed by others. 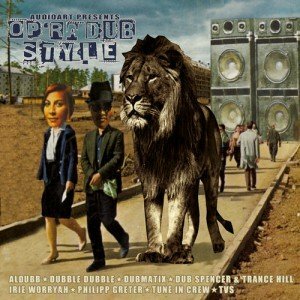 The album “AudioArt presents Op’Ra Dub Style” (One-Drop Music/Irie Ites Music) includes tracks by Aldubb, Dubble Dubble, Dubmatix, Dub Spencer & Trance Hill, Tune In Crew and a further track by TVS. It also presents remixes by Irie Worryah and Philipp Greter (Dub Spencer & Trance Hill). As well as Speng Bond, additional vocals were recorded by Birthe Bendixen, Saralene and Karl Emmanuel. Last but not least, Hornsman Coyote contributed his amazing trombone playing.